Whether you are hosting an event in Hawaii or planning a festive luau on the mainland, these pressure sensitive Aloha name badges are a great way to identify guests at your next event. Calling all event planners! 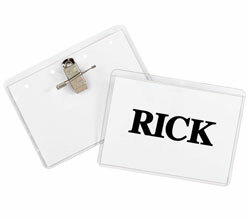 Use these unique name badges to personalize your next event. Whether you are planning your company's next conference in Hawaii or putting together a fun luau-themed retirement party, these pressure sensitive Aloha name badges are a great way to identify guests at your next event. Unique tabbed edge makes it easy to peel off backing paper and apply. Overall badge size: 3 1/2 x 2 1/4. Do not apply to vinyl, leather, suede, corduroy or silk. Red. 100/BX.